Our experts will assist in solving your problems so that you can work effectively! Our qualified experts provide certification services for oil field equipment, equipment for the chemical and oil refining industry, geophysical tools, as well as explosive materials and explosive related products (i.e. perforating charges). Conformity Certificates issued by “Special Industrial Examination”, CJSC are registered with the Unified Register of Rosstandart. Laboratory personnel conduct destructive and nondestructive testing and provide you with the relevant reports containing the test results. 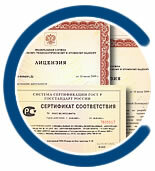 The experts at “Special Industrial Examination”, CJSC are certified with the RosTekhNadzor and Rosstandart Federal Departments. Our test center specialists have the qualification certificates based on the RF and ЕN 473 and ISO 9712 requirements.